Julep nail polish was a fantasy nail polish for me. I would see it in my Pinterest travels, and I knew it was very fancy nail polish, so I waved it out as an option to own. Back in Februrary, I found a code for a free Julep Maven box. I was ecstatic! I started my little collection of Julep nail polishes, and Julep products. To pay $14 for a good nail polish that lets your nails breathe, and that don't cause nail fungus is probably the best deal. Not only are they great quality, but they also add antioxidants to your nails. 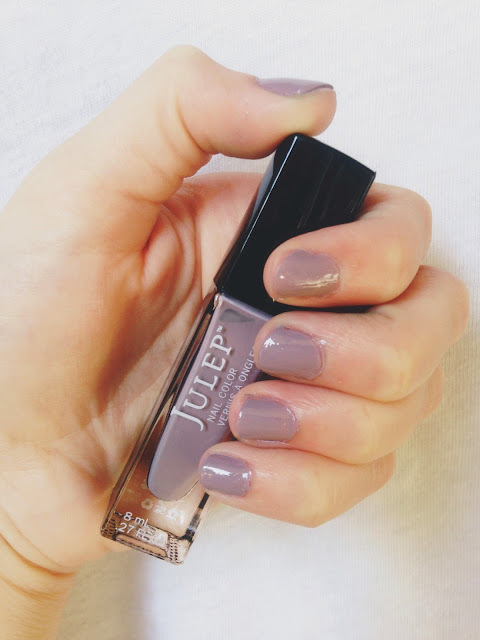 These nail polishes from Julep are extremely beneficial to your nails. I want to tell you how much I love Julep nail polishes. They are like couture for your nails. The first time I brushed the perfect Julep polish on my nails, it got me hooked on Julep polishes. The beautiful collections they have to offer, and the glamorous colors that only add to your nails. I have featured this color in a previous post, but I wanted to elaborate on this beautiful shade. 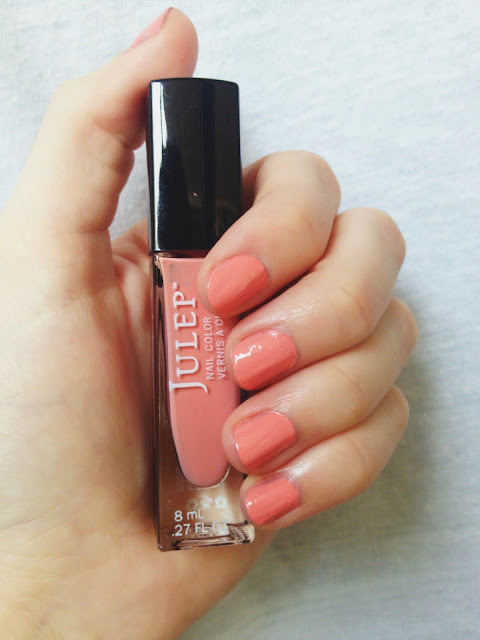 Julep calls it Teri, and it is from the It Girl collection. It is such a peachy pink color, and it is so cheerful. It is definitely a springy, summery color, but with all it's allure, I'm sure there is a spot for Teri in Fall. Another glorious addition to the Julep polishes is the fact that they are vegan, and are against animal testing. How awesome is that? This next color is Alaina from the Classic With a Twist collection. It is a light lavender shade to describe the pigment. This is a darker, solemn color with a hint of happy. It is great color for Fall, and a good color for Spring. I love wearing this color. Another from the It Girl collection, Libby is a bold, very pigmented, and a great color for all seasons. It would be described as teal, and without a base coat, it totally stains your nails. Libby also satins your skin around your nail when you accidentally paint outside the nail. It is a beautiful color, but it I am not partial to the fact that it stains my nails and skin. 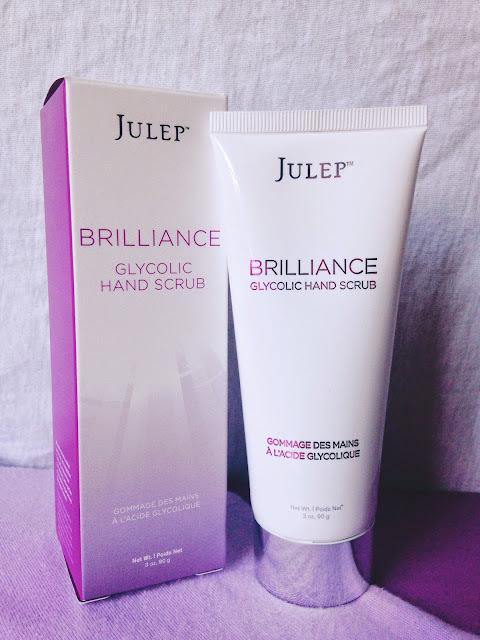 In a previous post, I did a review on Julep's Bare Face cleansing oil, so Julep has a spectrum of beauty products. To cater to the hands, they a lovely hand scrub that I adore. It has a delicate, perfumy scent, and the scrub is not too abrasive on your hands. I love this hand scrub, it feels so nice, and makes my hands feel so soft. It even hydrates your nails. I always use the scrub after I take my nail polish off. Your nails always feel dry after having color torn for them, so they need some hydration, and the hand scrub helps with that. I will always be a fan of Julep products. They are quality, and I can trust that they will take care of my nails and skin. 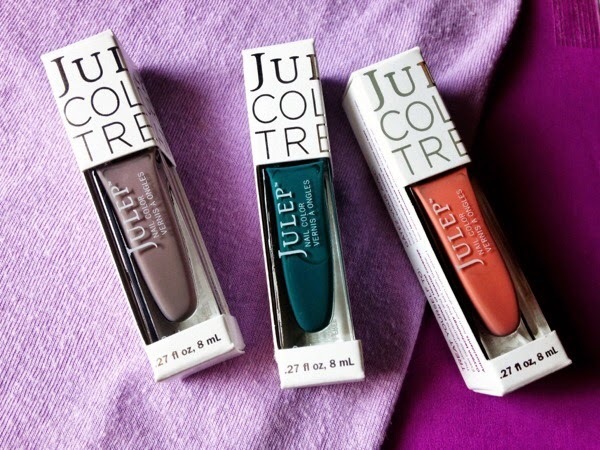 I am excited to review more Julep colors. To me, they have the very best nail polishes. I hope everyone is having a sunny Sunday! Enjoy your week!